The core of any mattress is its support system and most mass-market mattresses feature variants of an 80 year old design. While these spring units may have been dandy during the great depression, they don’t offer the consistent, edge to edge support for your body. Sherwood® mattresses feature an innovative open coil design that provides up to 21% more support than conventional mattresses. And if you’re looking for enhanced individual support, some Sherwood® mattresses feature our luxurious pocketed spring coil system. This design allows each spring to respond independently to the shape of your body to improve conformance while virtually eliminating sleep-disturbing motion transfer. All memory foams are not created equal. Lower cost, lower density variants of this popular material do not provide the same conforming support or pressure relief as the premium, open cell memory foam used in EvoSleep Mattresses. Not only is our memory foam of better quality, it is one of the most breathable available. A unique manufacturing process provides natural ventilation that helps equalize the temperature of your sleep environment. High Density soy-based cushioning materials are used to increase durability and provide conforming comfort and superior support. This material offers a green alternative to foams used by mass-market brands that are made with large amounts of petroleum byproducts. Naturally derived from the milk of the tropical rubber tree, latex foam provides the ultimate in natural pressure relief. In addition to its exceptional comfort, latex foam is also naturally hypo-allergenic, dust mite resistant and breathable. Sherwood® mattresses feature high-end woven and knitted fabrics that far exceed industry standards. These fabrics look as amazing as they feel and also improve the durability and performance of our beds. Many Sherwood® mattresses feature high-density foam encasement to improve stability and expand the usable sleep surface. 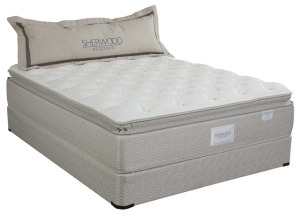 Sherwood Bedding’s manufacturing systems are some of the most advanced in the world. Our products have been rigorously tested to assure that it meets the highest global quality standards. By utilizing the bedding industry’s only natural flame retardant materials, Sherwood® mattresses are compliant with over 17 international flammability standards. This extra level of protection provides peace of mind for your family without introducing toxic chemicals into the environment or your home.